Just as dust gathers in corners and along bookshelves in our homes, dust piles up in space too. But when the dust settles in the solar system, it’s often in rings. Several dust rings circle the Sun. The rings trace the orbits of planets, whose gravity tugs dust into place around the Sun, as it drifts by on its way to the center of the solar system. The dust consists of crushed-up remains from the formation of the solar system, some 4.6 billion years ago — rubble from asteroid collisions or crumbs from blazing comets. 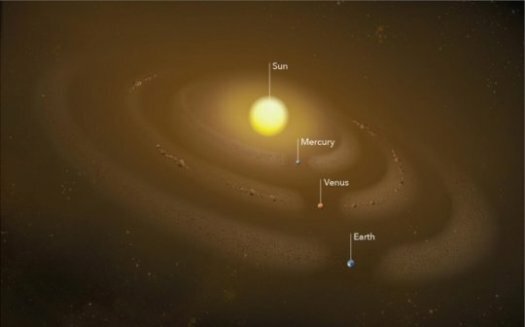 Dust is dispersed throughout the entire solar system, but it collects at grainy rings overlying the orbits of Earth and Venus, rings that can be seen with telescopes on Earth. By studying this dust — what it’s made of, where it comes from, and how it moves through space — scientists seek clues to understanding the birth of planets and the composition of all that we see in the solar system. Two recent studies report new discoveries of dust rings in the inner solar system. One study uses NASA data to outline evidence for a dust ring around the Sun at Mercury’s orbit. A second study from NASA identifies the likely source of the dust ring at Venus’ orbit: a group of never-before-detected asteroids co-orbiting with the planet. Guillermo Stenborg and Russell Howard, both solar scientists at the Naval Research Laboratory in Washington, D.C., did not set out to find a dust ring. “We found it by chance,” Stenborg said, laughing. The scientists summarized their findings in a paper published in The Astrophysical Journal on Nov. 21, 2018. They describe evidence of a fine haze of cosmic dust over Mercury’s orbit, forming a ring some 9.3 million miles wide. Mercury — 3,030 miles wide, just big enough for the continental United States to stretch across — wades through this vast dust trail as it circles the Sun. Ironically, the two scientists stumbled upon the dust ring while searching for evidence of a dust-free region close to the Sun. At some distance from the Sun, according to a decades-old prediction, the star’s mighty heat should vaporize dust, sweeping clean an entire stretch of space. Knowing where this boundary is can tell scientists about the composition of the dust itself, and hint at how planets formed in the young solar system. So far, no evidence has been found of dust-free space, but that’s partly because it would be difficult to detect from Earth. No matter how scientists look from Earth, all the dust in between us and the Sun gets in the way, tricking them into thinking perhaps space near the Sun is dustier than it really is. Stenborg and Howard figured they could work around this problem by building a model based on pictures of interplanetary space from NASA’s STEREO satellite — short for Solar and Terrestrial Relations Observatory. Ultimately, the two wanted to test their new model in preparation for NASA’s Parker Solar Probe, which is currently flying a highly elliptic orbit around the Sun, swinging closer and closer to the star over the next seven years. They wanted to apply their technique to the images Parker will send back to Earth and see how dust near the Sun behaves. Scientists have never worked with data collected in this unexplored territory, so close to the Sun. Models like Stenborg and Howard’s provide crucial context for understanding Parker Solar Probe’s observations, as well as hinting at what kind of space environment the spacecraft will find itself in — sooty or sparkling clean. Two kinds of light show up in STEREO images: light from the Sun’s blazing outer atmosphere — called the corona — and light reflected off all the dust floating through space. The sunlight reflected off this dust, which slowly orbits the Sun, is about 100 times brighter than coronal light. “We’re not really dust people,” said Howard, who is also the lead scientist for the cameras on STEREO and Parker Solar Probe that take pictures of the corona. “The dust close to the Sun just shows up in our observations, and generally, we have thrown it away.” Solar scientists like Howard — who study solar activity for purposes such as forecasting imminent space weather, including giant explosions of solar material that the Sun can sometimes send our way — have spent years developing techniques to remove the effect of this dust. Only after removing light contamination from dust can they clearly see what the corona is doing. The two scientists built their model as a tool for others to get rid of the pesky dust in STEREO — and eventually Parker Solar Probe — images, but the prediction of dust-free space lingered in the back of their minds. If they could devise a way of separating the two kinds of light and isolate the dust-shine, they could figure out how much dust was really there. Finding that all the light in an image came from the corona alone, for example, could indicate they’d found dust-free space at last. Mercury’s dust ring was a lucky find, a side discovery Stenborg and Howard made while they were working on their model. When they used their new technique on the STEREO images, they noticed a pattern of enhanced brightness along Mercury’s orbit — more dust, that is — in the light they’d otherwise planned to discard. With an unexpected discovery and sensitive new tool under their belt, the researchers are still interested in the dust-free zone. As Parker Solar Probe continues its exploration of the corona, their model can help others reveal any other dust bunnies lurking near the Sun. This isn’t the first time scientists have found a dust ring in the inner solar system. Twenty-five years ago, scientists discovered that Earth orbits the Sun within a giant ring of dust. Others uncovered a similar ring near Venus’ orbit, first using archival data from the German-American Helios space probes in 2007, and then confirming it in 2013, with STEREO data. Since then, scientists determined the dust ring in Earth’s orbit comes largely from the asteroid belt, the vast, doughnut-shaped region between Mars and Jupiter where most of the solar system’s asteroids live. These rocky asteroids constantly crash against each other, sloughing dust that drifts deeper into the Sun’s gravity, unless Earth’s gravity pulls the dust aside, into our planet’s orbit. At first, it seemed likely that Venus’ dust ring formed like Earth’s, from dust produced elsewhere in the solar system. But when Goddard astrophysicist Petr Pokorny modeled dust spiraling toward the Sun from the asteroid belt, his simulations produced a ring that matched observations of Earth’s ring — but not Venus’. This discrepancy made him wonder if not the asteroid belt, where else does the dust in Venus’ orbit come from? After a series of simulations, Pokorny and his research partner Marc Kuchner hypothesized it comes from a group of never-before-detected asteroids that orbit the Sun alongside Venus. They published their work in The Astrophysical Journal Letters on March 12, 2019. “I think the most exciting thing about this result is it suggests a new population of asteroids that probably holds clues to how the solar system formed,” Kuchner said. If Pokorny and Kuchner can observe them, this family of asteroids could shed light on Earth and Venus’ early histories. Viewed with the right tools, the asteroids could also unlock clues to the chemical diversity of the solar system. Because it’s dispersed over a larger orbit, Venus’ dust ring is much larger than the newly detected ring at Mercury’s. About 16 million miles from top to bottom and 6 million miles wide, the ring is littered with dust whose largest grains are roughly the size of those in coarse sandpaper. It’s about 10 percent denser with dust than surrounding space. Still, it’s diffuse — pack all the dust in the ring together, and all you’d get is an asteroid two miles across. Using a dozen different modeling tools to simulate how dust moves around the solar system, Pokorny modeled all the dust sources he could think of, looking for a simulated Venus ring that matched the observations. The list of all the sources he tried sounds like a roll call of all the rocky objects in the solar system: Main Belt asteroids, Oort Cloud comets, Halley-type comets, Jupiter-family comets, recent collisions in the asteroid belt. Perhaps, the two scientists thought, the dust came from asteroids much closer to Venus than the asteroid belt. There could be a group of asteroids co-orbiting the Sun with Venus — meaning they share Venus’ orbit, but stay far away from the planet, often on the other side of the Sun. Pokorny and Kuchner reasoned a group of asteroids in Venus’ orbit could have gone undetected until now because it’s difficult to point earthbound telescopes in that direction, so close to the Sun, without light interference from the Sun. Co-orbiting asteroids are an example of what’s called a resonance, an orbital pattern that locks different orbits together, depending on how their gravitational influences meet. Pokorny and Kuchner modeled many potential resonances: asteroids that circle the Sun twice for every three of Venus’ orbits, for example, or nine times for Venus’ ten, and one for one. Of all the possibilities, one group alone produced a realistic simulation of the Venus dust ring: a pack of asteroids that occupies Venus’s orbit, matching Venus’ trips around the Sun one for one. They needed to show that the very existence of the asteroids makes sense in the solar system. It would be unlikely, they realized, that asteroids in these special, circular orbits near Venus arrived there from somewhere else like the asteroid belt. Their hypothesis would make more sense if the asteroids had been there since the very beginning of the solar system. The scientists built another model, this time starting with a throng of 10,000 asteroids neighboring Venus. They let the simulation fast forward through 4.5 billion years of solar system history, incorporating all the gravitational effects from each of the planets. When the model reached present-day, about 800 of their test asteroids survived the test of time. Pokorny considers this an optimistic survival rate. It indicates that asteroids could have formed near Venus’ orbit in the chaos of the early solar system, and some could remain there today, feeding the dust ring nearby. The next step is actually pinning down and observing the elusive asteroids. “If there’s something there, we should be able to find it,” Pokorny said. Their existence could be verified with space-based telescopes like Hubble, or perhaps interplanetary space-imagers similar to STEREO’s. Then, the scientists will have more questions to answer: How many of them are there, and how big are they? Are they continuously shedding dust, or was there just one break-up event? The dust rings that Mercury and Venus shepherd are just a planet or two away, but scientists have spotted many other dust rings in distant star systems. Vast dust rings can be easier to spot than exoplanets, and could be used to infer the existence of otherwise hidden planets, and even their orbital properties. But interpreting extrasolar dust rings isn’t straightforward. “In order to model and accurately read the dust rings around other stars, we first have to understand the physics of the dust in our own backyard,” Kuchner said. By studying neighboring dust rings at Mercury, Venus and Earth, where dust traces out the enduring effects of gravity in the solar system, scientists can develop techniques for reading between the dust rings both near and far.